The Authorize.net SIM payment gateway will allow your attendees/registrants to pay for their event registration with a credit or debit card on a secure webpage, hosted on Authorize.net. Need to Buy a Support License for the Authorize.net SIM Payment Gateway for Event Espresso 4? This add-on requires Event Espresso 4.6 or newer. It cannot be used with old versions of Event Espresso 4. Download the latest version of the Authorize.net SIM payment gateway for Event Espresso 4 from your Event Espresso account. Authorize.net is closing down their Authorize.net SIM service. They recommend switching to Authorize.net Accept. Click on Authorize.net Accept and paste in the API Login ID that you just copied. An account with Authorize.net is needed to accept payments via Authorize.net. Login to your WP-admin (WP Dashboard) and go to Event Espresso –> General Settings –> Payment Methods. Once on the Payment Methods screen, click on Authorize.net and click on the button to activate the payment method. Authorize.net API Login ID – This credential is needed to process payments and can be found in your Authorize.net account. Authorize.net Transaction Key – This credential is needed to process payments and can be found in your Authorize.net account. The Authorize.net SIM payment gateway will let you accept payments via major credit or debit cards. This is an offsite payment gateway which means that attendees/registrants will process their payment on a secure webpage on Authorize.net. I configured Authorize.net SIM and payments are not being processed. Can you help? First, double-check that you are using your API credentials for production (live) mode which are different than your login information for your Authorize.net account. Also, ensure that there is no extra spacing before or after the credentials in the payment methods screen of Event Espresso 4. 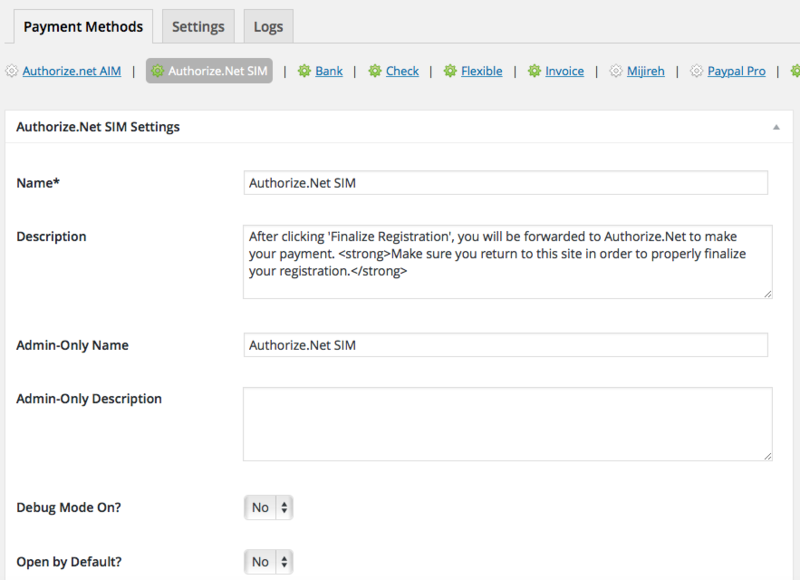 How can I setup a recurring payment or subscription through Authorize.net SIM? Recurring or subscription payments are not currently supported in the Authorize.net SIM payment gateway. Refunds in Event Espresso 4 are currently a two step process. First, apply the refund through the transactional details screen of Event Espresso in your WP-admin (WP dashboard). Then login to your Authorize.net merchant account and process the refund. Is an SSL certificate needed for Authorizenet SIM?